The African Women’s Development Fund (AWDF) in collaboration with FEMRITE – Uganda Women Writers Association, invites African women writers and journalists to apply for the Writing for Social Change Workshop 2015. This 10-day writing workshop, will be taking place in Uganda from July 27 to August 5, 2015. Priority will be given to interested women journalists who wish to actively engage in women’s activism – we are expecting at least 50% of the writers selected for this workshop to be full-time journalists. We will also include women from AWDF’s existing grantee organizations, and within our partner networks. Deadline for submission is May 31 2015. Only those accepted to the workshop will be notified by June 5, 2015. To apply send an e-mail to; communications@awdf.org. Elizabeth Ohene, from Ghana, is a veteran journalist, writer and broadcaster, and a former government minister. Her career began at Ghana’s leading newspaper group the Daily Graphic, (owned by Graphic Corporation), where for over a decade she served as a reporter, staff writer, columnist and Editor. In London in 1983, she founded the Talking Drums, a weekly news magazine on West African affairs and served as the Publisher/Editor for the three years of the magazine’s existence. Elizabeth joined the BBC World Service in London, UK, in 1986, first as a Producer of Radio Programmes, then served in various positions in the World Service and British Domestic Radio, and as a columnist on the Focus on African Magazine. She also served as Deputy Editor for the award winning Focus on Africa Programme. She reported regularly for the BBC from various parts of Africa and was the resident correspondent in South Africa from 1992 to 1994 during the transition from apartheid to the first democratic elections. Miss Ohene conducted several training programmes for journalists for the BBC in South Africa, Nigeria, Liberia, Senegal, Sierra Leone, Kenya, Ethiopia and Somalia. She also ran a network of more than 150 stringers located in all parts of Africa for the BBC Africa Service, supervising their editorial work. Miss Ohene’s professional activities include being a member of the International Women Media Foundation which actively promotes women’s competency and leadership in the media. 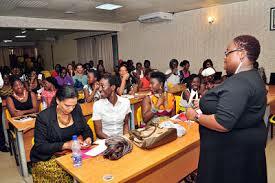 The foundation has established an Africa Women’s Media Centre in Dakar, Senegal, where courses are run for African women in the Media according to their needs. She served as a board member of the International Commission of Investigative Journalists and a member of the panel of judges for the CNN Africa Journalist of the Year Competition. She served in government as a Minister of State from 2001 to 2009. She currently writes a weekly column in the Daily Graphic, Ghana’s largest circulating daily and a monthly Letter from Africa for the BBC. Yewande Omotoso, born in Barbados, grew up in Nigeria and currently lives in Johannesburg. Yewande trained as an architect at the University of Cape Town, to which she returned after working as an architect for several years, to complete a Masters in Creative Writing. The product of her degree is her debut novel ‘Bomboy’ published in 2011 by Cape Town publisher Modjaji Books. ‘Bomboy’ was shortlisted for the 2012 Sunday Times Literary Awards, the MNet Film Award and the 2013 Etisalat Prize for Literature. It won the South African Literary Award First Time Author Prize. Her other works include short stories ‘Two Old People’ in the anthology ‘Speaking for the Generation: Contemporary Stories from Africa’, ‘How About The Children’ published in The Kalahari Review, ‘Things Are Hard’ in the 2012 Caine Prize Anthology and ‘Fish’ published in The Moth Literary Journal. Yewande’s poetry is published in the Baobab Literary Journal. ‘The Rain’ was shortlisted for the 2012 Sol Plaatjie European Union Poetry Awards. She was a 2013 Norman Mailer Fellow and the 2014 Etisalat Fellow at the University of East Anglia. She is a 2015 Miles Morland Scholar. interested in the complexity of human experiences as well as the incongruities of life. Loneliness is a recurring theme. Omotoso views her writing as a tool for compassion and evoking self-examination. For her talent and the intent to tell stories, she credits her parents and a childhood steeped in reading and the sharing of ideas. Previous Post Help Save Lives!!! Next Post NYSC Orientation Camp Is Not A Suffering Camp!